Chip is still the greatest! He's the "glue" in our family now, and we would all just die if something ever happened to him. I am a BIG dog fan... having had Danes and Rotties all my life. However, this little dog's heart could not be any bigger! 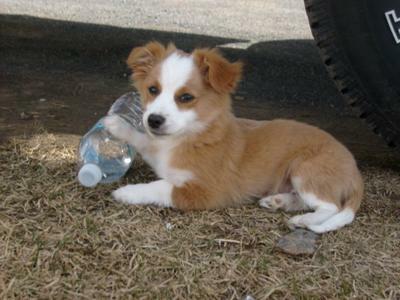 See what Chip, one of the cutest Malchi puppies, looked like at 14 weeks old! Brody is 14 weeks old. Adorable little guy. Giant heart. Also giant bites. Sweetest disposition. He play bites super hard. So small. I know I must address this now. Therefore, I'm posting pictures of my little man and also looking for advice. I do not want him afraid. I was worried that he would be a shaker. He is far from it, but I could see it happening. Happy Malchi-ing every one. I know you all are having a blast, as am I with Brody. My name is Linda and I am hoping one of you will help me. 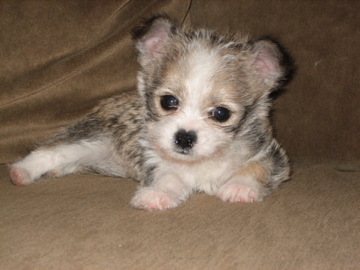 I need a photo of adorable Malchi puppies for my Web site and I cannot find one anywhere. Would any of you be willing to let me use your photos on my Web site? Please let me know. My email address is linda@cpipets.com and my phone number is 480-510-2353. Thank you! cutest dog ever.chip is so cute. are these malchi puppies non-shedding? Looks juuuuust like my baby that i got on memorial day weekend.. I am completly head over heals in love with him.. Great temperment... And soooo loving. Always at my side.. Congrats on your baby! sooooo very cute! we are both blessed! One of the cutest Malchi puppies ever! Suri is just the cutest little girl. She is a little over one year old and about 6 pounds. She has the sweetest and calmest personality - she loves to roll over and fall asleep on her back! I have a male malchi. he is about one year and 8 months old. i am looking for a female. can you PLEASE tell me where you found this adorable girl? Did you name her after Tom and Katie's little girl Suri? That is such a cute name! Remy is my almost 6 month old Malchi puppy. He's only 3 lbs and not getting any bigger! He is a true lap baby! He loves getting his tummy rubbed, and he loves going shopping with me! He also has a very wild side to him! He love treats and does 3 tricks already. He loved to play with torn plastic bags, empty bottles, hair brushes, and my phone! She was the most loving adorable little girl ever. I had her for 11 years until two weeks ago an American bulldog jumped my fence & killed her before my very eyes. I wish & pray I could get another Malchi but have yet to find one. If you ever get one you will never want any other breed. They are so unique. Where did you get your Malchi? He is so adorable. I have heard that they are great dogs and have been looking for one. I live in the birmingham area and have had no success finding a breeder. Do you have any numbers or information. I just got my Lacey yesterday. She's 11 weeks old and she just is FULL of energy! She loves to craw low to the ground as well as look at herself in the mirror. She also enjoys playing with other pups her age and size. She's easy to cuddle with as she sleeps easily on my arm (not the whole night, just naps :) ). Love your Puppy. Which breeder did you purchase her from? I am looking for a malchi like yours. I have one just like yours and love them. Can't seem to find a breeder. I have one of the best 5 month old Malchi puppies Oscar. He is adorable as you would imagine. I am trying to train him on the leash, but doesn't seem to like it at all. He is quite frightened on walks and would rather be carried. I suppose this could be one of their characteristics being so small. Should I push on with trying or is it just who he is? My Malchi puppye gets on quite well with other dogs and loves people of all sizes - small children and adults. He weighs around 8lbs or 4 kilos, and has an horrendous appetite. Will eat anything any time. Is this normal? My Malchi puppy is a sweetie with people, but I haven't seen her with other dogs yet. She is very energetic and playful. She has the cutest little bark (squeak). How well do this dogs get along with other dogs or pets? How old is he? My dog is 4 month but his hair is shorter... I'm trying to see if his hair might turn out like your dog. 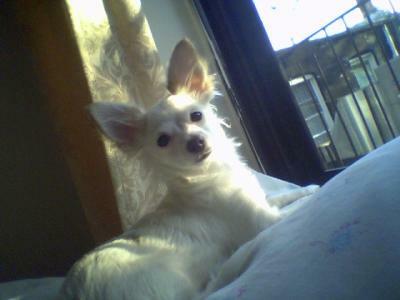 I also have a malti-chi..she just turned a year old and is the love of my life! She is the most amazing little "person" that I could have every hoped for. She loves playing with people and dogs alike. I like in an apartment complex and her best friend is Cloey, a dachsund/poodle mix. She also loves playing with my roommates chocolate lab. Meco is one of our black and white Malchi puppies. He has long hair, he's a fun loving mamas boy and likes nothing more then to please his people. He's 4.8 lbs and a feather weight. Easy to take anywhere. His 2 sisters are the same. 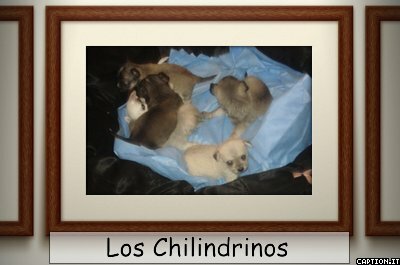 We love our Malchi puppies and have created a breeding program for the best babies ever, healthy happy in home and ez to train. We love our Malchis! He's a devil in disguise! Our 6 month old Tylenol cures all our headaches! Malchi puppies are the best. He's 9 pounds of pure cleverness, curiosity, and innocence. 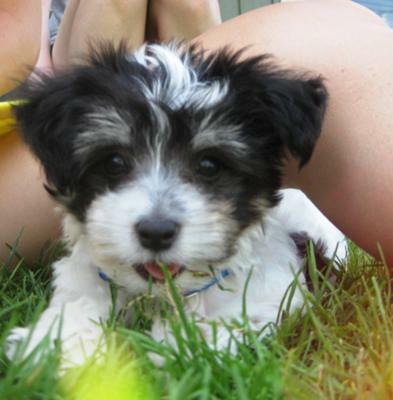 He is your typical puppy (inquisitive, mischievous, keeps you on your toes). When you're not looking, he'll walk to your sock drawer and pull a nice, meaty, juicy sock. When you turn around to see what he's up to, he'll look at you with those big puppy eyes (tears included). His heart is bigger than his body. His bark is bigger than his bite (he likes to protect our house, all 9 lbs of him), but he LOVES visitors, and loves other dogs. He always wants to play! He loves to walk, and he learns tricks relatively quick. He learned sit, lie down, rollover, high five, and shake in just 1 month. We saved him from a PUPPY STORE. 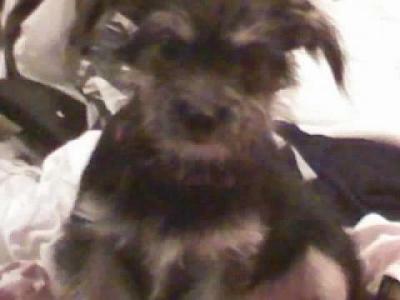 He was locked up in a small cage with another puppy for 3 weeks. We just had to save him! Hey, when you got your dog did he have short hair? Bc my dog is only 4 months but his hair is not as long I thought it would be....but his mom did have short hair but his dad was a malti and he had long hair. So I don't know. 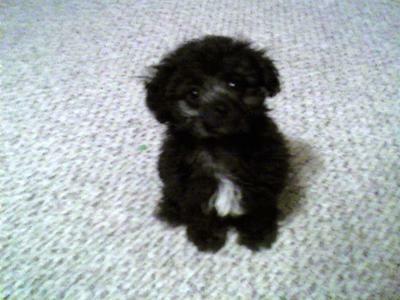 unfortunately, the pet store we got him from, as with most pet stores, get their puppies from puppy mills, mostly in IA. It makes us sad about the life that he lived, but it makes us so happy that he has a full, free life ahead of him. Tylenol is so adorable. 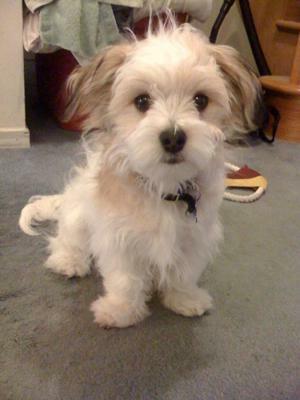 He's the cutest Maltese I've seen. I think he should be Maltese of the Month for March. Mr. March has a nice ring to it. Where did you rescue him from? 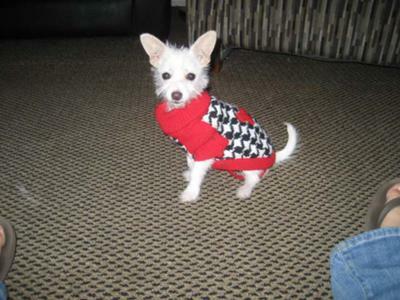 Our little Zoe we later found out was probably from a puppy mill in PA. Most of these designer breeds unfortunately are products of horrific conditions. The Amish of PA are among the biggest offenders...raising dogs as though they were livestock...breeders never leave their cages. There's no socialization of the dogs... they spend their entire lives in cages and when they can no longer be bred, many are shot. 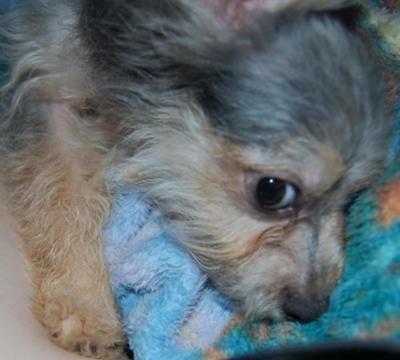 About 97% of puppies sold in pet shops come from puppy mills. Tylenol is the cutest thing I've ever seen. I hope that he didn't come from a puppy mill. This is Grady our new baby. He is a Chihuahua and Maltese mix. I think he is one of the cutest Malchi puppies I have ever seen. He is 3 months old and full of personality. We just love him. hi there. i have a malchi who is around 2 1/2 years old. i feel like he could use a playmate but as you all know our dogs are hit and miss with other dogs. any suggestions on breeds that get along with them? Cole is 11 weeks old and already potty trained. My Malchi puppy has a great personality. He is always energetic and playful with everyone. He does not attack strangers. Him being energetic at all times could get annoying, but I definitely prefer my dog to be in a playful state and know that he is happy rather than being sad and down all the time. My dog is very loyal and listens to our commands. He never tries to run away, which is a huge relief that we don't have to worry about him escaping one day. I'd have to say that what makes my dog so special is that he simply just loves to play. I couldn't ask for a better dog. I am truly happy to be the owner of this wonderful dog. My Malchi puppy is a very sweet, delicate dog. She is also very energetic. She loves to play around kids,and she can also be very protective when she feels the family is being threatened. She's an absolutely intelligent dog; easy to train and takes commands very well. And I forgot to mention she is only four months old. I would recommend this type of hybrid to any family. We meant to post as our names, not "Anonymous"! 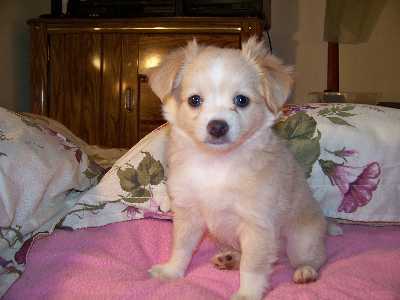 Taffy is one of the most adorable little Malchi puppies. 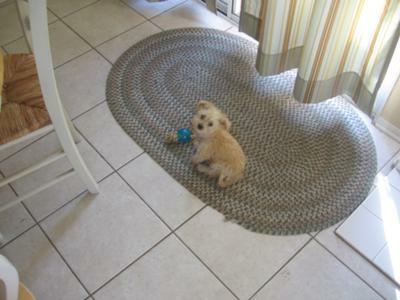 She loves to play with toys and also with an older dog (Muffin). Taffy slept in a crate the first few nights after coming to my home when she was 12 weeks old. However, she was not happy in the crate and soon after being allowed to come to the bedroom, she learned how to get on my bed (first by climbing the bedspread and soon was able to jump onto the bed). She definitely wants to be with me whenever possible. When I do need to leave her at home she will go to "her room" and settle down with just a pat to her head. I would like to know though what to do about stress to the dog. If riding in the car she produces a lot of saliva and her little mouth becomes totally "soaked". When I come home after leaving her she becomes very anxious if I don't get into the house quickly enough. This results in her mouth and front feet becoming soaked, with saliva. Does anyone have suggestions in this regard? Thank you. This is our new Malchi puppy Zeus, he is 8 weeks old. 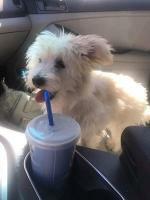 He is so full of energy and loves to play all day with his big brother Titas a 1 year old Maltese. I am so glad to have adopted a Malchi he is one of the best dogs you can have! 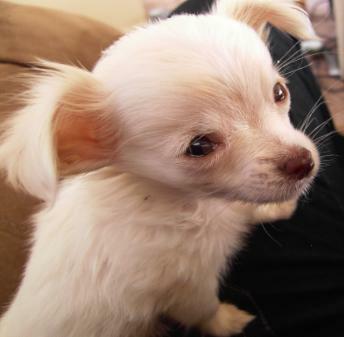 soooo adorable :) I have a girl malchi and is about 5 pounds. I luv her so much. We got Scooter about four days ago, he is 9 weeks old. Like alot of Malchi puppies, he is so loving and sweet!!! So little!! I had no idea what a Malchi was until this website. I am crate training him and hes only had ONE accident (knock on wood) so far. He goes everytime I take him outside!! 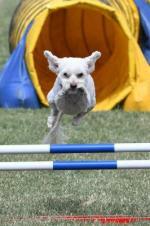 I had a Poodle years ago and she wasn't even this good!! I would like to hear anyone else's take on the crate/potty training of these pups. All websites that I read are all different. Thanks so much!!! LOVE MY MALCHI, Scooter!!!! I found my Malchi at a pet store. I was told he was a malshi. But he is for sure a Malchi. Elliott has stolen my heart. He is great with kids and is very protective. I couldn't be happier. I feel as if we saved him. Pet stores are horrible. Bella is 6 months old. What a nice dog. Raised by man in wheel chair. Comes on comand. Lays by my feet. She stays off furniture. I think she is the greatest thing that has came into my life for some time. Loving with my grandchildren and adults. It most def. will get better as time goes on and he trusts you more. Scooter is a yr and some change now and he still, at night, sleeps in his crate. If I stay up later than normal, he is staring at me like, put me in my bed, whats going on?? LOL. Your little guy will actually learn to love his little home, as long as it never traumatizes him!! Good Luck!! Cooper is my little Malchi. He is 3 months old. I rescued him from a shelter 2 days ago. I'm working on crate training him and he is doing pretty well. I'm concerned about him at night... He is fine with the crate as long as the door is open and he can see me. He goes crazy when I close the door for the night. He hasn't had an accident in the crate (knock on wood) but still doesn't like it very much. He has whined/barked for about an hour at night for the last two nights...Will this get better as time goes on? He is very funny looking!! Most people think he is a rat terrier. haha. His hair is very wild. Most Malchis that I have seen look very different though. It is hard to explain how he looks but I will try to get a new pic up soon!! I say, Scooter is so ugly hes beautiful!! My daughter and husband say hes cute, but we love him with all our hearts no matter how he looks, he is a WONDERFUL dog, smart, loving and obedient!! Good luck!! Hi, I am adopting a Malchi that looks like Scooter. I am just curious how is he going to look when he gets older??? He is the BEST doggie I have ever owned, he is completely house trained, he is protective but GREAT with my three kids, two of which are little. He is very calm and laid back. I love him sooooo much and tell everyone when he gets old and passes away, I WILL be gettin another Malchi!!!! My scooter mcpooter is the very BEST!!!!! I am the VERY happy "mother" to an almost 4 month old Malchi named Wrigley. We are retired now and he is the first dog we've had in 40 years and what a delight he is. We rescued him from a shelter and he is such a good dog and devoted to me though he gets along well with everyone. His crate training and house breaking are going along very well. He wants to please and is such a delight!! scooter is now 4 months old, and he is the most precious dog that I have ever had! I love him so much and I am so glad that I decided to get him!!! I couldn't even imagine it if I did not have him!! He is so smart, he cries to go out and he loves my three children. I LOVE SCOOTER!!! Scooter is the first puppy I've seen that looks anything like my percious Cozette (Cozi for short). 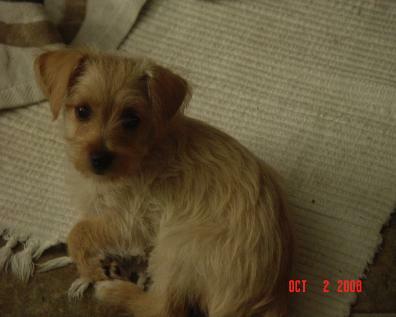 She is short-haired, blonde like her mother, and definitely appears to be more of a Chihuahua than a Maltese. She is the first small dog I've ever owned, and the absolute love of my life! Best of luck with Scooter! Hi. It has now been ten days since we got Scooter and he is WONDERFUL!! Im in love!!! He still has only had the one accident and he is so smart, if he chews, all you have to do is tell him NO and he will stop!! Im amazed with this pup!!! We also have a wolfdog and they LOVE eachother!!! 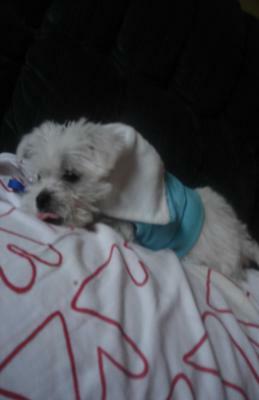 Hi I also have a Malchi puupy named Daisie she is 3 months now but has been the easiest dog I have ever had to train! she is pad trained (she is a house dog because Im disabled and can't always take her out in time)she hits the pads every time and I just had new carpet installed! I have a pad in the bedroom and one by the patio door and if we don't get outside, she goes on the pads. if she gets busy playing and has to go right away, she will run to the front bathroom and go(she did that on her own)but I think they are very smart,lovable dogs. good luck and enjoy! One of the most energetic Malchi puppies! Bella is a 3 1/2 months old Malchi puppy and full of energy. She is learning to walk on a leash and hang out with much bigger dogs. She was a little timid at first, but getting used to it. Everyone thinks she is the cutest and pretty much is. We love having her around! Awww! What a little bundle of sweetness! It look & sounds like you have terrific little pup! I think this is the cutest bundle of fluff I've seen since I walked out of my loungeroom. (Where my Malchi reclines on the evening sofa!) Bella is an absolute sweetie. Kegan ready for the game! Kegan is a VERY friendly and courageous Malchi puppy! He is 7 months old and weighs 5 1/2 pounds! His favorite game is fetch! Your dog looks similar to the other malchi on this site, Tuffy. Kegan is in the process of shaking! He sits and lays down! ( this is a tough one for Kegan! ) Kegans health is good! Although he does have a sensitive tummy! Hes housebroken and uses a potty pad! The housebreaking was unusually easy for kegan, to my dismay! Kegan is a VERY big mamas boy! Like the Maltese everywhere i go! the same age and weight. How is Kegan's health? housebroken? Zoe uses a litterbox. I fell in love with my Malchi puppy Paryss from the moment I saw her. She is a tri color Malchi (MOSTLY BLACK). Her father was Chihuahua and her mother was Maltese. She is the smallest, cutest, little puppy. She is currently 6 months old. Paryss is very good with children and adults. She is very friendly and loves to run around. She is very smart. In the beginning she was a little hard to paper train, but with a little time and patience she got great. She now is house broken and has been since she was about 4 months. I LOVE HER AND I WOULDN'T TRADE HER FOR THE WORLD. Rocky the Malchi puppy is a VERY jealous little pooch! If you do not pay attention to him, he will get mad and poop on the carpet. He gets extremely jealous when I play with my rabbit, so he will attack and bite the rabbit then bark at me. Hard to believe huh? He looks so innocent, but is the biggest devil ever! He is really spoiled too! My Malchi will not eat plain kibble. Only kibble mixed with boiled chicken meat. Everything has to be done his way. End of story! that last comment was absolutely correct! While you might think it cute right now while he's a puppy, if you encourage or allow that aggression, it will get very out of hand when he's all grown up and you could end up with a dead rabbit or some person getting bit. Please be sure to show your adorable dog who is really pack leader (you) and gain his respect now before he is out of control later! Socialize him by taking him to a good dog park, and everywhere else you can. 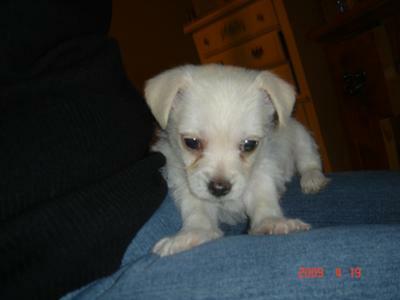 We have a male malchi also (He's "no-Name yet" (as a puppy), and then later "Chip" on this site... . I have always done everything I could to socialize him as much as possible. Fortunately, he does not bite, but he is still fearful of strangers and likes to bark / act stand-off-ish when meeting new people. Had I not taken him everywhere from the beginning, I definitely would have had a very aggressive dog on my hands. Good luck with your guy... he really is very cute but YOU are in charge! Rocky, you sound like a handful! Hi Rocky, we are two Maltese dogs LuLu and LoLLy! We read your post and we think you need doggy yoga! It is very eggsiting and calming! You should check it out on http://www.luluandlolly.com! Also, Two Paws UP! for the eggselent pikture! Your Maltese paLs, LuLu and LoLLy! or Cesar Milan to visit b4 he nips someone he should not - happened to me - they have 2 years to sue - I waited with baited breath for my 2 years to expire and thankfully they did with no recourse but my little snapping turtle Maltese caused me a little grief a few years back and now she is better but not quite perfect around strangers!! Good Luck - he's adorable!! He loves to play like most Malchi puppies. He's very active, playful and very loving. He sits beside me all the time and follows me around like a shadow. He loves it when I rub his head and underside. When we go outside he does not go very far from me and at the slightest noise he is at my feet. He sleeps a lot but as soon as I move he's awake. As soon as I take off my shoes he picks them up and gallops away with them. Then he comes back looking for more shoes. I love my Malchi. He's so much fun. Whenever anyone comes over all he wants to do is play with them. I have had the cutest of all Malchi puppies Tucker for 3 weeks!! He weighed 1 lb 12 oz when I got him. I actually went to the ladies house to look at a Morkie and she brought him and his sister out too and I fell in love with my little man. He is so adorable. My Malchi puppy weighs 2 lbs and 2 oz now!! I was trying to puppy pad train him and he will go on it after his naps and I sit right there with him, but he will not poop on it, he always goes and hides. I am taking him to work with me right now and I take him outside all the time and he doing pretty good on that. My Malchi sleeps most of the night without having to go which is great. Is it too late to start crate training him now since I have not been doing it for three weeks and the breeder didn't do anything to train him I don't think. Any advice would be great. How to start, what size crate I need to get, how do i get him to go in it, etc. I love him so much he is sweet but also is full of energy and it teething and biting everything. I posted an update on Cooper. It has a new picture of him. I would love to see what Tucker looks like now. Hello. We got Cooper in April of last year, he was a little over 10 weeks old. He was born at the end of January 2009. He is also very hairy and weighs six pounds now. He is very sweet and loves rawhides and bones instead of toys. I posted a thing on him a while back but he looks different now. I'll update. OMG!! !Im really freaking out right now. This is def my dogs brother. We got cooper in Lexington and the picture of him was on the same quilt. Tucker is a real cutie. 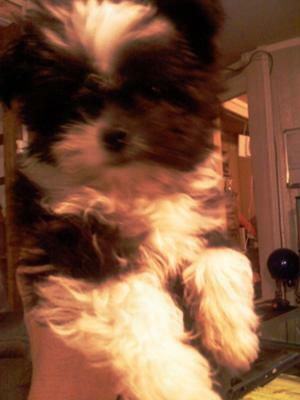 We have a little Morkie and she hadn't been in a crate when we got her. I bought the 2nd size to small of crates and put a couple blankets and a stuffed animal in there. I set the crate next to my bed at night and Belle snuggled right in the very first night. They make little stuffed toys that have a "heartbeat" and a warmer in them. Foster and Smith has them and I'm sure others too. Belle is also pee-pad trained. We live in Minnesota and it's too cold for her to go out. She has her little quirks about her pads though. She has one she goes right to to piddle on and we praise her and give her a "potty" treat. But... We have a 2nd pad in another room for her to poop on. She doesn't like to be watched. As far as the crate, they are wonderful to use also for keeping puppy out of trouble if you are busy. Belle has never gone potty in her crate. Hope this helps a little. Good luck with Tucker and Belle says to tell him hello. Gizmo is 3 months old now. He is a very loving cuddly dog, as most Malchi puppies are. However, Gizmo can be a ½ pound bully and harasses our 2 year old beagle named Buddy. 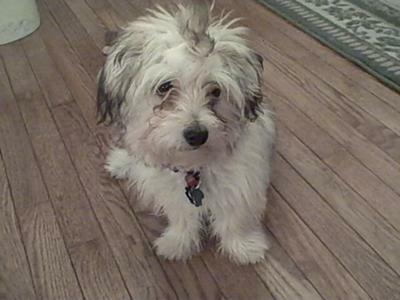 Gizmo is a scraggly dog, but in a cute way. It is hard to tell too much about such a young puppy, however, he likes to be active but he is small enough that he can get most of the exercise he needs running around our house. Gizmo loves the whole family but he definitely attached himself to my wife more than the rest of us. 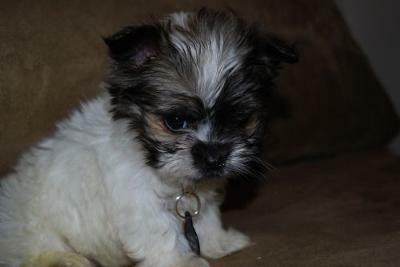 Gizmo is a social puppy but he does think that he is a big dog trapped in a small dog’s body. We are currently working hard to correct his nipping and barking and he is responsive to our training despite the fact he is a teething puppy with a barking beagle for a best friend. We were able to potty train Gizmo to use a litter box with pee pads in less than a week. Our Malchi is very intelligent and easy to love. We would recommend this type of dog as a companion to anyone, but we recognize he has qualities to make him especially attractive to elderly people and apartment dwellers. Malchi puppies are adorable and have plenty of personality to share with you. Two Paws UP! for Gizmo! My malchi is 12 week's old and his name is Muppet and until I got him me nor my husbasnd really wanted a little dog, but he has brought so much joy and happiness into our live's. He is black and white. just like the big guys. 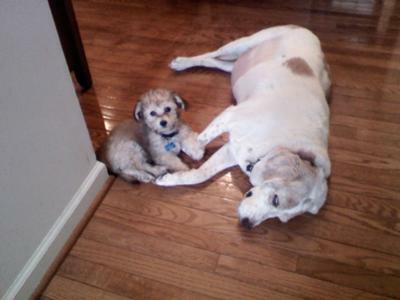 We have a 5 pound malti-poo and an 85 pound malamute and a 70 pound golden. The little one always wants to be out in front on walks and can easily handle 3 mile hikes on trails. Yet if she's frightened by a loud sound or a big barking dog, she quickly hides behind her "bodyguard." matter how small the dog, however, I think it's really important that we honor their "dog nature," by taking them outdoors to sniff, investigate, and experience their surroundings. It's pretty boring to be cooped up in an apartment all day, no matter how small you are. who is 85 and frail. While the puppy was litterbox trained from day 1, I think she still has too much energy for an elderly person to handle. A dog needs to play and sniff outdoors in the fresh air a few times a day. Actually, our malamute has a much more sedate laid-back personality. 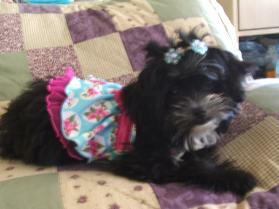 Our malti-poo has frenetic energy...she just keeps hopping and bouncing...seems to say "play-with-me, play-with-me." She'll be a year old in June; I'm not sure if she'll ever slow down enough for my Mom to be able to handle her. Until then, she is having a great time keeping up with our golden retriever and our malamute. I tried to find the cutest picture and this one seemed pretty good ,but no picture can exactly show how adorable she really is. I just got my Malchi about a week ago and she is one of the most adorable Malchi puppies I've ever seen. She was only 8 weeks and still a tiny baby weighing around a pound. She has mostly Chihuahua features yet her fur is a little fluffier and lighter and it doesn't seem as if she sheds. Even when we first got her she was friendly and loving, but now that she's getting to know us were starting to see her feistier, playful side. One of her favorite things to do is curl up right against your neck under your chin and take a nap. She also loves to give kisses all the time as long as you'll let her. She is one of the smallest and most adorable Malchis I've seen and i think everyone would agree. I too, have a Malchi and she looks ALOT like your Baby Girl. Daisie is now 9 weeks old and her fur is getting fuller & longer. and your right,they are just the sweetest little things! ours also cuddles up by my neck.Thanks for sharing. Hello Baby Girl, this is LuLu and LoLLy, we're 2 Maltese dogs. This is certainly one cute picture, no doubt about it, and we bet you really ARE even cuter than we can see here! What a sweet face. We're happy you have good chins to lie under! Love, your PaLs, LuLu and LoLLy! I just got one of the tiniest Malchi puppies. He was born on Nov. 30, 2008. His name is Bambino and he loves to be rubbed on his chest. He is very playful and gets along with most people. I have been raising, fostering, placing and caring for many different breeds for many years. 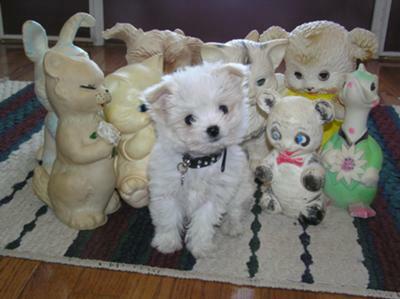 Here is a picture of one of the cutest Malchi puppies Stelling and his "Buddies" taken at 3 months old. He was really amused by the company of this gang and seemed to enjoy the "photo shoot"! He is adorable. Looks just like my lil Belladonna. Oh my goodness! That is the cutest little dog. He looks just like one of the stuffed animals with him. How fun! Nate is 4 months old weighing in at 5 pounds. He is one of the best Malchi puppies ever andenjoys long walks down the road and bacon flavored treats. My Malchi puppy would love a female companion to spend his day with. 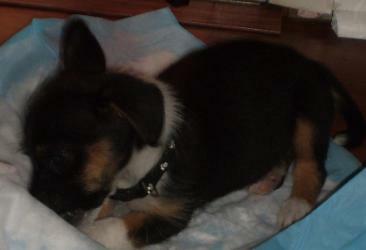 Jack is one of the cutest Malchi puppies (black with some white markings). He is nine weeks old and very friendly and playful. He has been very easy to train. He is very lovable and listen well. I have only had my Malchi for a few days and already do not know what I would do if he were not here. i am so attached to him already!! Two Paws UP! for Jack! Of all the Malchi puppies, she is the most active Malchi I have seen. She runs as soon as she hears my voice. Very playful and lovable. She is the third one born of her sisters and one brother. 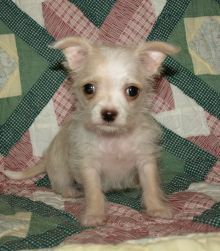 Button is one of the cutest Malchi puppies and is a little sweetheart. At only 6 weeks old she follows me everywhere and is already going potty outside. My Malchi puppy gets on quite well with other dogs and loves people of all sizes - small children and adults. He weighs around 8lbs or 4 kilos, and has an horrendous appetite. Will eat anything any time. Is this normal? the very reason why i started searching these web sites was to take a look at malchi dogs in hopes that i would never see 1 that looked like mine. BUT YOURS DOES!!! check out mine(cloud) hes bigger now then he was in the picture. their twins!! he even has yellow ears!!! Two paws UP for Oscar! Dear Oscar, We are two Maltese dogs LuLu and LoLLy. We understand how you feel about the leash. Why walk when you can get carried? Two Paws UP! for keeping your human guessing! Your paLs, LuLu and LoLLy! We've now had our Malchi puppies Sally for about 4 months now she is about 8 months old. She is the smartest dog. The most loving dog ever. Very loyal. We love her. Dear Sally, we are 2 Maltese dogs named LuLu and LoLLy, and we wanted to say it was wonderful to read your post becuz obviously your human loves you so much. LoLLy is a rescue and she knows just how much it means to live with good humans who take care of you, now that she has come to live with us! Keep spreading a lotta love, Your PaLs, LuLu and LoLLy Maltese! 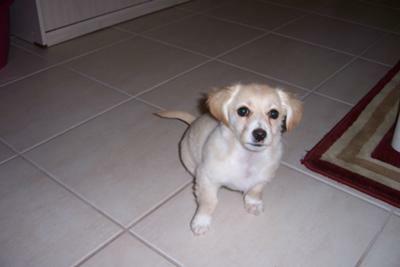 My Malchi puppy is just 6 weeks old yesterday, May 11, 2008. We have only had her three days. She is so small and sweet. We wanted to paper train her but she does much better outside on the grass. Any suggestions about training would be appreciated. awe, thats so cute. Its amazing that it is already 'going' outside at that age. Chihuahuas are one of the easiest breeds to train, and they are extremely smart, i have a Maltese, Malchi and a chihuahua. 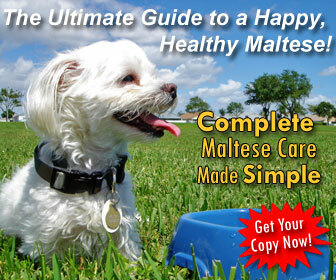 Maltese can be a little more independant, cause my female maltese was EXTREMELY hard to train. We got her at 9 months, and she wasnt fully trained until a year. The previous owners actually gave up on her cause she was a little hard headed. If your pup is already going outside, i would just stick with that. You could teach it to use a puppy pad though for when it rains, cause my dogs wont go potty if it is raining outside. Its easier to train them to a puppy pad then newspaper. They have that certain smell that attracts them, and makes them want to potty on them, but some dogs dont like them. It all depends on your puppy though, you know it better than anyone :). Need any more tips, or help please ask. good luck with your beautiful Malchi, they make excelent companions. I've had my Malchi puppy Mickey for two weeks now and he is the best dog I have ever had. He is 12 weeks old. The breeder where I got him didn't believe in crate training, so she was puppy pad training him. When I brought him home, I put down puppy pads but I also took him outside quite often throughout the day. I'm happy to say that he never used the puppy pads and has never had an accident in the house. He also sleeps all night long - since the first night. He has a puppy pen (not a crate) and he goes in there around 8:00 pm, gets in his little bed and I get him up at 4:30 am and take him out. My daughter runs a childcare and on weekdays Mickey goes there. He is great with the kids, plays good with them and naps when they do. It's a good learning experience for the kids and also a good social experience for Mickey. I have two cats and my daughter has two cats. Mickey loves to play with them and they are very tolerant of his puppy enthusiasm. Mickey also enjoys running and playing with my son's Cocker Spaniel. I was never a small dog person. My previous dogs were a Newfoundland and a Great Pyrenees. I loved my big dogs, but my Malchi Mickey has shown me that small dogs have BIG hearts! 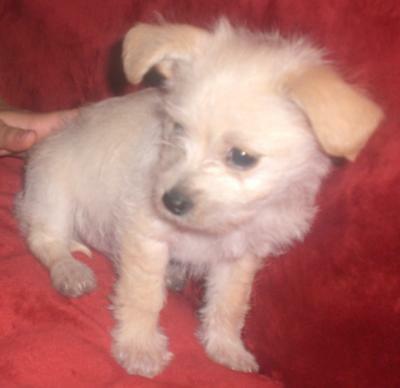 We fell in love with this little white bundle of Malchi puppy joy who will be one year old on Mar 22, 2009. 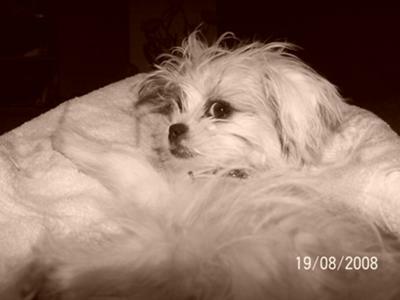 Bijoux loves and seeks attention from everyone, including strangers,yet she is on high alert whenever she hears a noise in the house or at the door. This 4 pounder loves to play, cuddle, car rides, shopping malls. We took her to Florida earlier this month: she was so attentive to everything going on around her. She is an incredible communicator: I can understand everything she wants by the way she looks and stares at me! Her eyes are so expressive. She lets me know when she wants something, and if I don't agree, she lets me know vocally and through her side looks that is is upset! The only thing that gives me trouble is feeding time: she is extremely finicky: what she loves today, she will look at in disgust tomorrow! Other than that, she is very intelligent, sweet, smart and I just love her! She is sooo cute. 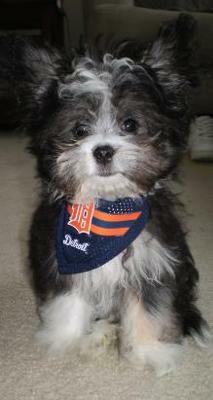 Looks just like my little Maltese (3 1/2 lbs) Cilla (call her cillable). What a sweeite pea!!! 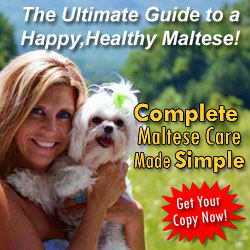 Hi Bijoux -- we are 2 Maltese dogs, and wow! What a great picture! Also, we are glad that your humans are so smart that they can understand you. With our Humans, we can say, "WE want more treats!" very loudly and clearly, only to have them say, "Oh, you want to take a bath?" and next thing you know it's suds city. Sigh. holy cow...Bijoux and I are born on the same day!! 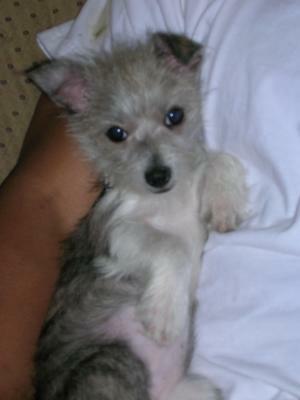 Happy B'day to Bijoux on mine and my good friend Carries birthday...she is the cutest thing EVER! Here is a picture of one of the best Malchi puppies Chip at 14 weeks old. He is so much fun and we love him so much! He is very smart, and has learned to sit, speak, sit pretty, and roll over... all on command ALREADY! Everywhere we go, people want to know what kind of dog he is and where he came from. One lady we met in Delaware just bought his last litter-mate and had him flown in to her last weekend. See what Chip, one of the cutest Malchi puppies, looks like at 6 months old! Two Paws UP! for Chip! Hi Chip! We are Maltese dogs LuLu and LoLLy! We wanted to give you Two Paws UP! for your adorable pikture! You are one of the cutest puppies we have ever seen! Also, Have you heard about our health care reform? Lots of dogs are signing up and you don't want to be left out! Join out coalition at http://www.luluandlolly.com! Your Maltese paLs, LuLu and LoLLy! She knows many tricks, and she loves everybody! She is just 5 months and about 3 pounds. 2. Sleep by your head. 3. Play with the cat. 5. Lick your nose to wake you up every morning. We trained her how to sit in just two days. She loves corn pops as a snack/treat. She can dance on her hind legs for long periods of time, especially when she's happy.